Yesterday I got a surprise delivery. Yup on a Sunday. My husband came in and handed me a package I wasn’t expecting. I love surprises. 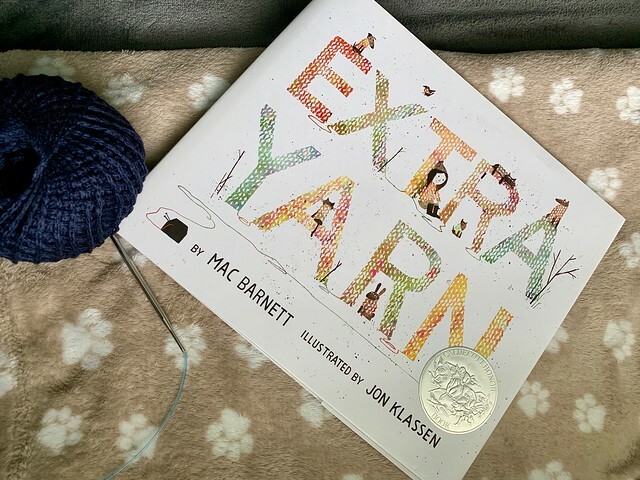 My girlfriend Melissa sent me this book, Extra Yarn, with the note that every night she and her daughter read this and she always thinks of me. I almost cried. I love books. I grew up with a mother who ran adult literacy programs, who always made books seem like magic and whenever we moved the first thing we got was a library card. I was even a volunteer librarian one summer in Lawrence, MA. I love books as gifts, I do. And this book…it’s special. It’s about a little who knits colorful things for others and never runs out of yarn. I felt like it was me and all the things I make for people. She even sounded like me when people made fun of her for wearing such colorful knits. No wonder she thought of me and I’m so thankful to have such great friends that do think of me. It’s sweet and the illustrations are adorable and it’s going right into my craft room on display so I can smile whenever I see it. And I think it’s a perfect book to give to either a crafter you know and love or any child. I might just order a few for some of the children I know. Thanks, Dana! A gift like this is so special when it’s so personal to who you are. Gonna get this book to share with my granddaughter. This book sounds fabulous. What a beautiful gift! I’m going to order it from my local bookstore. Sounds like I definitely need to add it to my knitting book library. Thanks for the heads up on this book, my grandsons will love it. Thank you! What a perfect gift to give to new parents, along with some knitted love. We love this book! My kids have always known me as a maker/knitter/spinner person, and the idea that we should be wrapping our lives in knitted goodness is natural to them. So glad you have been gifted this one! I love it! Not only colorful but dog sweaters! Thank you for recommending it. What a great gift! That’s awesome! My daughter gave me this book for Christmas with a sweet message. I display the book where I knit. Friends and family are the best ❤️. This is one of my favorite books. I was lucky enough to get a print of one of the illustrations, and it’s framed and hanging in my little creativity nook. That book is a favorite in our house. What a dream it would be to never run out of yarn. My little guy loves this book. 🙂 As do I. This book was gifted to me a few years ago, and is one of my very favorite kids books; I would read it each year to my 3rd and 4th grade girls handwork group that I taught every Saturday. I love the art, and I love how one little girl transformed her community. You and your blog have given me courage to where my own colorful knits outside of my house/during the work week and at work. If you can proudly wear colorful knits on the east coast surely I can wear them in the mountain west. Thanks for plowing the road for us!